INCB 3284 dimesylate is a potent, selective and orally bioavailable human CCR2 antagonist, inhibiting monocyte chemoattractant protein-1 binding to hCCR2, with an IC50 of 3.7 nM. INCB 3284 dimesylate can be used in the research of acute liver failure.
. Xue CB, et al. 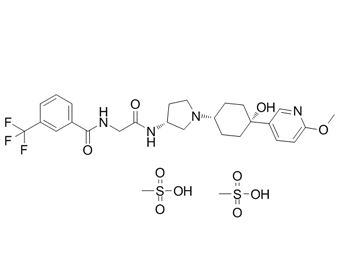 Discovery of INCB3284, a Potent, Selective, and Orally Bioavailable hCCR2 Antagonist. ACS Med Chem Lett. 2011 Mar 31;2(6):450-4.
. McMillin M, et al. Neuronal CCL2 is upregulated during hepatic encephalopathy and contributes to microglia activation and neurological decline. J Neuroinflammation. 2014 Jul 10;11:121.